Marie-Helene Bertino launched her debut novel, 2 A.M. at The Cat’s Pajamas last night at Greenlight Bookstore. Vintage jazz band Lapis Luna began the evening setting the mood for Bertino’s novel that takes place in The Cat’s Pajama’s, a Philadelphia jazz club. Bertino, who previously published the short story collection Safe as Houses (2012), celebrated the novel’s launch with a reading that included a dozen guest readers each sharing a portion of the opening chapter. Bertino kicked things off by reading the opening chapter, focused on Madeleine Altimari, a nine-year-old, cigarette smoking jazz singer. The other readers then continued the narrative reading sections as short as a few words or a long as a paragraph. 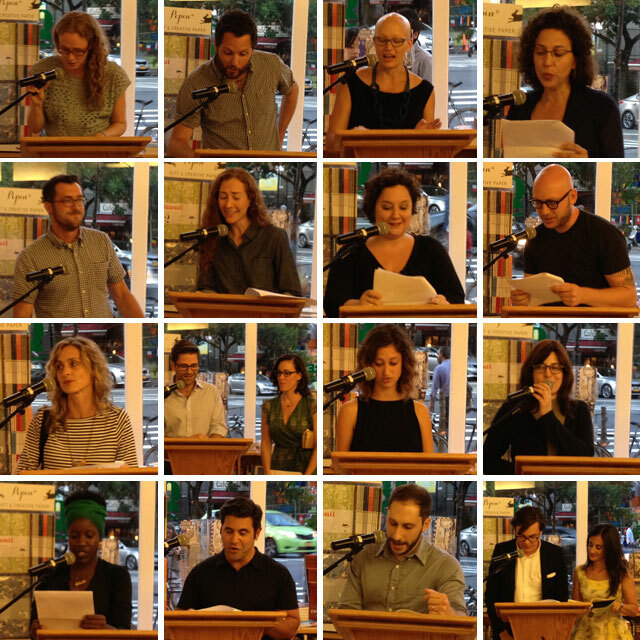 Some of the notable readers included Julia Fierro (Cutting Teeth), Adam Wilson (What’s Important is Feeling), and Penina Roth of the Franklin Park Reading Series. The novel took Bertino twelve years to write. She conceptualized it thirteen years ago after a night out in Philadelphia. She and her friends had gone out to Warmdaddy’s, a jazz bar along the Philadelphia waterfront. The night left her with an exhilarating feeling, and in the moment it, a night that seemed critically important, and yet, she says, nothing really changed. “Our lives were pretty much the same,” she says. With the novel, she out to capture that discomforting feeling that combines the excitement of the moment with the inertia of consistency. The novel is about the ultimate night out, even if that night out doesn’t have a lasting impact. The creation of the plot began with Lorca, the club owner who runs The Cat’s Pajamas. Bertino wanted the narrative tightly woven around him. Then she added Madeline, the nine-year-old singer. As she progressed, she decided the novel should span a full twenty-four hours, and she began adding the menagerie of characters. She decided that a book with a little girl’s voice would probably give just about everyone a say in the narrative, including, eventually, the city of Philadelphia. “After Philadelphia talks, there’s not much else to say,” she says. Spending more than a decade writing the novel meant that it wasn’t the only project she gave her attention to. She wrote short stories concurrently. “I wish I could say it was seamless,” she says of switching between genres. It wasn’t though. She describes the passing time as so many days of boredom followed by intense productivity. Still, the stories remained her refuge from the novel. Stories though are more difficult in a way. A novel justifies things that a story cannot, she explains. Novels offer more room to explore and make mistakes. “A short story is a magic trick,” she says. Not everything can be made to fit into a magic trick.